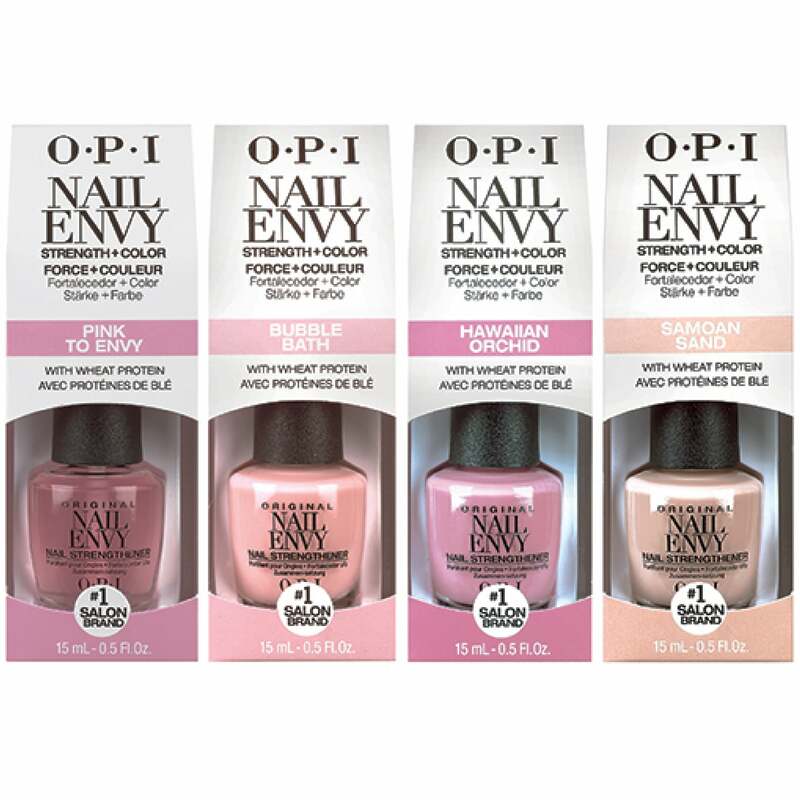 Nail Envy Nail Strengthener Original Formula Pink To Envy - A light pink with some darker pink hues. Nail Envy Nail Strengthener Original Formula Bubble Bath - A pale powder pink. Nail Envy Nail Strengthener Original Formula Hawaiian Orchid - A dusky deep pink. Nail Envy Nail Strengthener Original Formula Samoan Sand - A pale peach. Nail Envy Treatments are now tinted with three classic OPI Shades so you get a slight hint of colour whilst treating your nails. The Nail Envy formula helps nails to give stronger, harder, longer natural nails. First of all start by applying two layers then every other day apply one layer to maintain your treatment. Nail Envy also helps to speed up the growing process of your nails. For years OPI have been a leading manufacturer of salon quality hand care, nail care & skin care products.Ê A reliable & high quality brand which is sold worldwide in over 103 countries. Popular worldwide for constantly launching on-trend collections for every season of the year & adding core shades to their range. OPI are consistently praised for their high quality products, with access to research facilities which allows them to keep up to date with new formulas, this ensures the quality of their products keeps getting better & better - keeping OPI customers well up to date! OPI is setting the industry standard as the most successful professional brand, earning recognition across the globe and respect from magazine editors, celebrities and salon professionals. Showing 2 of our total 3 reviews, with an average rating of 5 stars. Read all 3 reviews for OPI Strength + Color Nail Envy Nail Strengthening Treatment 4 x 15ml. Two of the collection have been ‘nabbed’ by my daughters as they love them so much so I expect i’ll be re-ordering sooner than I thought!